the following article is one of a series that I originally wrote for the Northern Peaks Magic Magazine which was distributed to members of the Canadian Association of Magicians. My intension was to inspire the next generation of magicians to come up with some new ideas. As a result I occasionally touched upon aspects of methodology that shouldn't be made available to the general public, So I have decided to render these questionable sentences unreadable. please enjoy your glimpse behind the curtain of mystery and know that magicians are always hard at work trying to come up with new ways to amaze you. Welcome to the first installment of The Brainstorm Sessions. For almost thirty years I have been performing and building illusions for both my fellow magicians and myself. During this time I have accumulated a mountain of artwork revolving around objects of wonder and amazement. The walls of my office abound with sketches and photographs of magical props and concepts waiting to be lifted off the page and thrust into the spotlight. In an attempt to help magicians develop and build their own illusions, I have opened the doors of my Factory Fantastic. Within the walls of this somewhat eccentric studio, my guest magicians sit and discuss infinite possibilities. We watch videos, examine photographs, scan books and magazines and eventually produce several sketches. Choices are made and a plan is set into motion, the end result being the creation of a unique illusion that is an extension of their personality. Every magician should aspire to have his or her own look and a trademark personality. Consider magicians such as Jeff McBride, Rudy Coby, Criss Angel or Lance Burton. Each one of these magicians has a completely different persona. Their props are an extension of that personality. Jeff’s props are born from a world of mysticism and ritual, Rudy Coby’s look like they were pulled out of the pages of a comic book, Criss Angel manipulates the elements of the urban jungle, Lance surrounds himself with a combination of early Victorian, contemporary gothic and beyond. In the hands of these capable performers, even the standard collection of effects become unique. They make the illusions their own! Whether you get your illusion ideas while watching another magician or from one of the many illusion books circulating within the magic community, you should always consider what you see as merely… a good starting point. It is how you reinterpret the effect that can help define you as a performer. Even when considering the most standard of magical props such as the Sub-Trunk or Cutting A lady In Two or even a simple Sword Basket… there are always twists and turns you can employ to help your illusion stand out amongst the ocean of standard boxes. I affectionately refer to this creative process as “MAJINXIMIZING” an illusion! I always ask myself ‘how can I make this illusion more interesting to watch?’. Expanding the magical aspects of the prop by incorporating additional mechanical abilities or combining concepts and methods to create something totally unique. Lets take for example, the classic Harbin Zig Zag illusion. I have always wanted to replace the front panels of the illusion with white plexi-glass. The holes would be in the same place as the original. After the assistant settles into position, a light would be turned on within the cabnet. The front door would be illuminated revealing the silhouette of the assistant on the surface of the plexi-glass. I always thought that this added feature would enhance the convincing elements of this already ingenious creation. I’ve never owned a Zig-Zag illusion myself but I hope to get a chance to employ this added feature sometime in the near future. I do have a Cut In Two in the show and what we call The Splicer Machine was indeed an interesting creative journey. By 1992 my wife and I had been performing for several years and we ended our show with an effect we called The Hypnotic Brick. The presentation began with me placing Cynthia into a hypnotic trance rendering her incapable of moving or more specifically… bending. I would lift her body and perch it between two steel pillars, one under her feet and the other under her head and shoulders. A cement block was placed on her stomach and three knives under her back. I then proceeded to take a sledgehammer and smash the block into pieces. As many of you in the trade may be aware, this is more of a demonstration of physics than it is of “magic”. So I decided to expand the presentation to include cutting her in half. In my own mind the logic was sound. I hypnotize my lovely assistant and prove to the audience that she cannot move by smashing a brick on her stomach. I then take it one big step further and cut her in half. After examining the technical drawings of the “Thin Model Sawing” I realized that there were going to have to be a lot of changes made to the structure if it was going to work for our presentation. In the end the only thing that I kept from the original design was the method of body positioning. Everything else had to change. The first challenge was the fact that Cynthia was already stretched out between two pillars. That meant that the box was going to have to come down over her and basically wrap around her body. The ever-popular bevel base would have to go and in its place I designed two supporting arms, which stretch out along the bottom of each box. These arms held the boxes ready on either side of the pillars. After the smashing of the brick, I would tilt the boxes down over Cynthia. Once the boxes were in place, the doors would have to be closed under the body. At first, this proved to be mechanically clumsy but eventually worked itself out. The box itself was a little thicker than the thin model version however the entire front side of the box opened towards the audience revealing much more of the body. I found this to be more convincing than the two little windows on the traditional thin model. It also meant that I didn’t have to worry about people watching from the side or even from behind. The one obvious feature that made The Splicer Machine unique was the method of separation. Instead of simply pulling the body apart on the horizontal plane, the body opened up like a draw bridge. Cynthia’s head and torso tilted upward resulting in her being upside down and her legs tilted in the opposite direction leaving them hanging in an upright position. The image was quite striking and became the single most remembered aspect of the effect. The Splicer Machine became one of our signature pieces and throughout the years I made several modifications making it more compact and easier to perform. The first version needed two additional assistants to maneuver around the stage. It looked like a menacing monster. Ironically there were several complaints that the smashing of the brick portion of the effect was too violent so we eventually eliminated it from the presentation and simply cut Cynthia in half. By eliminating the “hypnotic–brick” portion I was able to make changes to the physical structure allowing me to perform the illusion without additional help. Throughout the years I have often thought about expanding on the routine taking a more comical route. Inspired by the spare wheel in my car, I thought it would be funny to have something happen to the legs. They could fall through the stage floor or the box could spontaneously develop a mind of its own and zoom off into the wings taking the legs with it. I would stand there for a moment somewhat dumbfounded, then sheepishly wander over to a cabinet and pull out a large suitcase with the word EMERGENCY painted across it’s cover. I would quickly lay it on the stage beside Cynthia’s torso and opens the lid. Taking crowbar out of the case I would insert it into the side of the suitcase and starts cranking it up and down. Suddenly a set of metal legs start rising out of the case and works their way up until they reached the waiting body. I would connect the legs to the box frame containing Cynthia’s upper half of Cynthia and cautiously stands back. The box is opened and Cynthia steps onto her new legs suddenly realizing what has happened. Infuriated she stomps off the stage in search of her own legs. 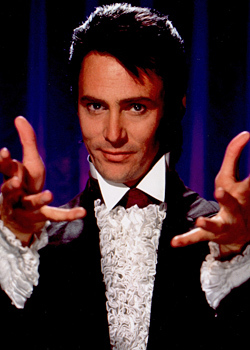 Great imaginations have come up with some wonderful versions of the cut in two illusion, but if I had to pick one that really stands out as the perfect story it would have to be The Death Saw created by Don Wayne for David Copperfield. If for some reason you haven’t seen this jewel, look it up on youtube. It’s perfect. Every questionable element is cleverly concealed within the fabric of the story. ███ ████████ ██ ██████ ███████ ████ █ ██████ █████ ███ ████ ████ ██ █████████ ██ ██████████ ███ ██████ ██ ███████████ ██ ███ ████ ██ ██ ████████ ████ ██ █████ ███ ██████████ █████ ████ █████ ██████ ██ ████ █ ███████ ██████ ███ █████████ ██ ██ ██████ ███████ ███ ████ ██ ██ ███ ██ ████ ███ ███ █████████ █ ████ ████ ██████ ████ ███ ███████ ██ █ █████████ ██ ███ ███████ ██ ██ █ ████ ████ ███ ████ █ ████████ ███████ Perhaps knowing why you are cutting your assistant in two will provide a solution. Are you bisecting her to find something lost inside or perhaps you are trying to create two girls out of one or maybe the assistant is a robot that needs repairs. Maybe you were supposed to be stretching her and she accidentally snaps in two. All these scenarios involve special costumes and props that can act as temporary masking to conceal the preparation. If you have a large cast of characters you can have the assistant lifted into the air by a group of dancers who carry her across the stage and lower her onto the table that is hidden by the dancer’s bodies. A moment later they separate to reveal the assistant stretched out on the table, locked in restraints. However not every magician can afford a cast of that size, in fact some magicians work alone. For these lone performers there are some very clever methods of “self-division”. Andrew Mayne has a couple of clever methods: one called Bisection and a new one called In Half. Both of these illusions are very affordable for the young up and coming magicians and I feel they leave plenty of room for expansion. Check them out on his website. As I watched The Bisection video I couldn’t help but wonder if this illusion was the spark of inspiration for the David Copperfield “Laser” illusion. It was originally called Man Apart and was created by Steve Fearson who sold the exclusive rights of this illusion to Mr. Copperfield for an undisclosed amount. Not an illusion to be performed in the round but a very interesting illusion nonetheless. You can see both Copperfield’s version of this illusion and the ususal parade of terrible attempts to copy this illusion on youtube. If you are willing to make a slightly more significant investment, there is a modified version of Modern Art called ‘Modern Art Reloaded.’ This is an illusion produced by Pro-Magic made available with Jim Stienmyer’s permission. It’s a very effective “do it to yourself” illusion where the magician has total control of the apparatus. I think it’s a great reinvention of an already very clever trick. I wonder what the future holds for this classic effect. I myself have over a dozen different concepts for the dismemberment of the human body. As I find myself nearing the end of my performing career, I prepare to pass on these wonderful concepts to the next generation who will have their work cut out for them. Competing with the visual splendor of today’s film industry where all miracles can be achieved by the diligent work of CGI artists. Perhaps we should prepare to put more effort into the story leading up to the illusion. Try to make what is happening on stage as important as how it is happening. What I mean by this is to create a really intriguing scenario that engages the audience’s imagination so much, that they almost forget to ask how it is being done. When I suggest that we push the envelope, I mean more than just painting the box a different color. I mean change it’s shape, take it apart and put it together in a new way. Find a way to hide the box or even get rid of it altogether. Until next time remember to ask yourself how many impossible things have you believed in lately?